We will perform pest control services that other pest control companies won’t — the pest control services that involve stinging insects! If you are looking for someone to take care of ants, cockroaches, spiders or other pests, you’ll have your pick of pest control services to choose from, each one as experienced as the last! 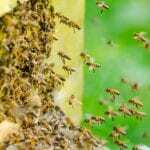 However, if you have a stinging insect like bees, wasps, hornets, honeybees or carpenter bees, you might have a harder time finding not just someone who will help you, but someone who is qualified to do so safely. Here at Florida Bee Removal, we want to be your go-to company to assist you with the pest control services that other pest control companies won’t touch — the stinging insects! Especially if you have a large swarm or hive of stinging insects, it’s important to call in our specialist pest control services. We have the skills and experience that keep us safe, and we are also able to perform these pest control services without risk to you or your family. We don’t just take care of the stereotypical hive hanging from a tree, either, but we are also able to help you should you need professional pest control services inside the walls of a structure. Stinging insects like wasps and carpenter bees are notorious for finding their way inside walls and making their homes there, and should that occur, you’ll need our professional pest control services to remove them! Here at Florida Bee Removal, we want to take the sting out of pest control services in Lakeland, Florida and assist you with the removal of the pests that other companies avoid. If you think or you know you have need of our pest control services, don’t try to remove them yourself! Instead, let us safely perform our pest control services for you.